It’s Sunday! That means another week of meal planning! Do you feel like each week rolls around too fast? We do! And just as we get another week of meal planning under our belt it’s time to start all over again! But don’t get worried or discouraged! Keep up the meal planning and try some of these ideas to make it even easier! Rotate meal plans – If you don’t like meal planning every week then rotate meal plans from previous weeks and reuse them again. The only planning involved with that is writing out the grocery list! Create a list of what we like to call Main Meals – Have about 20 of your families favorite meals in a binder and rotate them each month. Keep the other days of the month for dinner out, leftovers, freezer meals, or dinner at grandmas! Incorporate freezer meals – Keep a stash of ready to go freezer meals on hand and incorporate them into your meal plan so you only have a few meals to plan and cook each week. Keep it simple – You don’t need to be Julia Childs and cook gourmet dinners every night! Meal plan throughout the week – Meal plan a few minutes each day or spread out planning over the course of few days and before you know it it’s done! This weeks meal plan is about keeping it simple with these family favorite recipes! This is definitely one meal plan that you’ll want to keep in rotation every month! 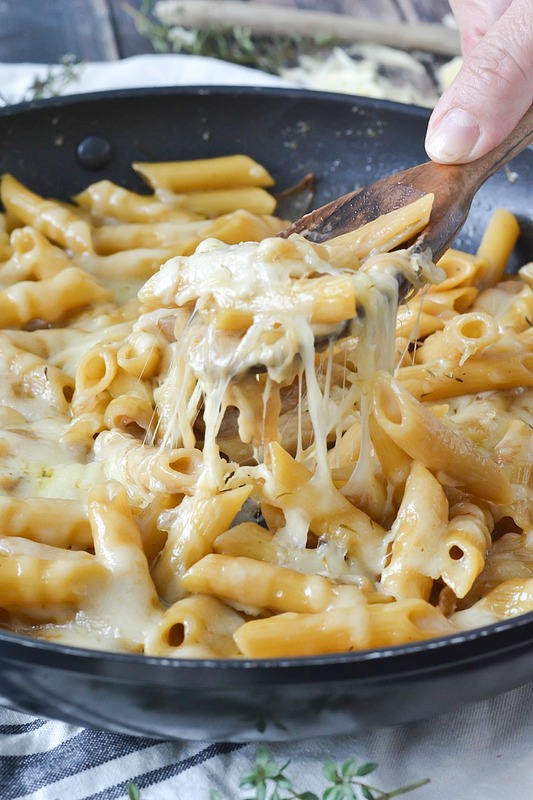 One-Pot French Onion Pasta – perfect for Meatless Monday! One pot is all you need to create this delicious meal with all the flavors of French Onion Soup that everyone loves! Once pasta is cooked stir in ½ cup of shredded cheese and sprinkle the top with remaining cheese. Crunchy Oven Baked Tacos – perfect for Taco Tuesday! Crunchy oven baked tacos are perfect for taco Tuesday! Cook ground beef in a large skillet over medium heat breaking up until crumbly and cooked through. Stir in taco seasoning and undrained Rotel and cook until most of the liquid is absorbed. Place taco shells in a 9x13 casserole dish. Use small ball of foil if needed to keep the shells standing up. Sprinkle the bottom of each shell with about tablespoon of cheese. Bake for 10-12 minutes until cheese is melted and bubbly. Serve with some of your favorite suggested toppings. The ultimate comfort food! The recipe below is for Creamy Homemade Tomato Soup. Just add in grilled cheese and dinner is served! 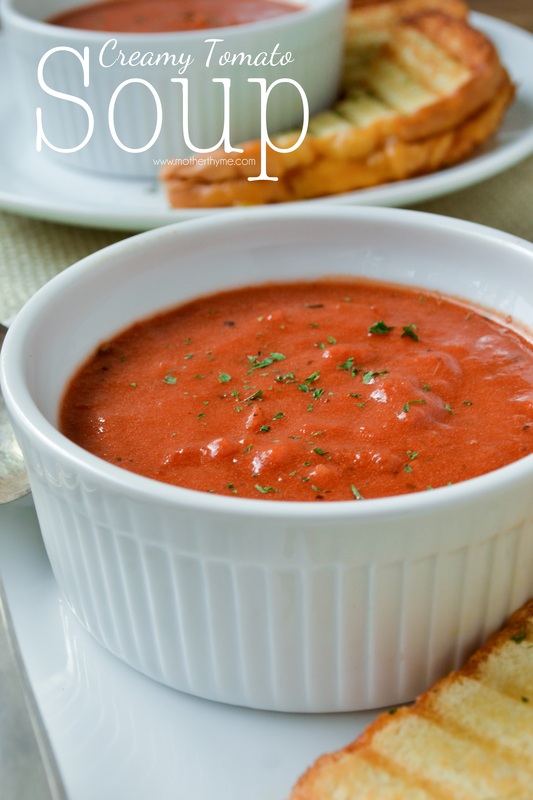 The perfect soup to enjoy with a grilled cheese or a bacon grilled cheese sandwich. Stir in shallots and cook until tender, about 5 minutes. Stir in garlic and cook for about 1 minute more. Add in crushed tomatoes, sugar, oregano, basil, half and half, broth, salt and pepper. Bring to a low boil and then reduce heat to a simmer and cook for just about 15 minutes longer. *For a thicker soup, use less broth or water. For a thinner soup add more broth or water, a few tablespoons at a time. 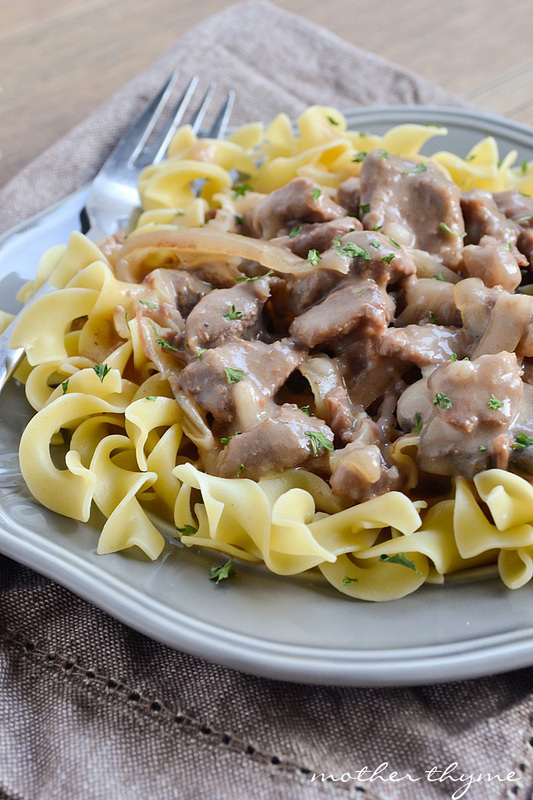 Let your slow cooker do the work in this classic and delicious recipe! Cooked egg noodles or rice for serving. Season meat with salt and pepper and place in slow cooker. Top meat with onions and mushrooms. In a small bowl mix broth, wine, Worcestershire sauce, tomato paste and garlic powder. Cover and cook on low for 6-8 hours until meat is tender. Mix flour with a small amount of water until flour is dissolved. Add flour to meat mixture, stirring until dissolved. Cook on high for about 15 minutes until slightly thickened. 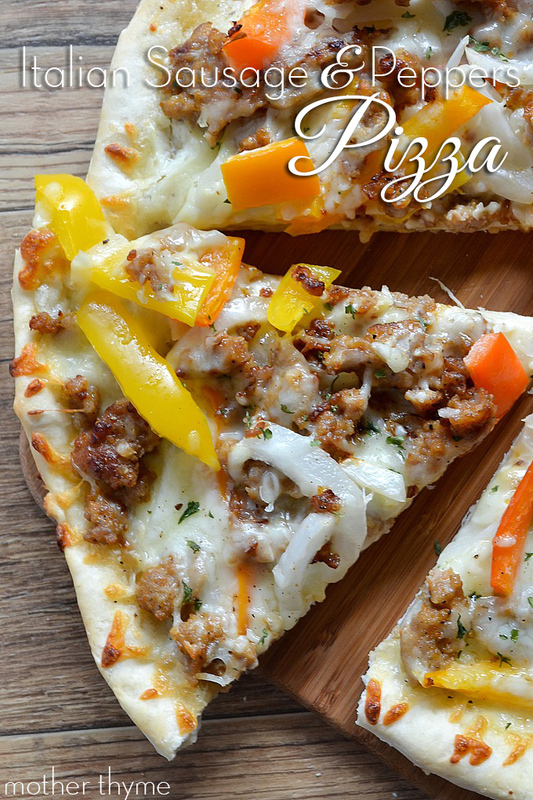 Italian Sausage and Peppers Pizza – great for Friday Night Pizza Night! Skip the delivery and make this delicious homemade pizza that has a secret sauce that you’re going to love! Combine 1 cup flour, packet of yeast, sugar and salt in a large bowl. Stir in water and oil until well blended. Gradually add in flour ½ cup at a time until dough forms a ball. Spoon dough onto a clean, floured surface. Dough will be slightly sticky. Knead until dough is smooth and elastic, about 4 minutes. Roll dough to a 12 inch circle and transfer to grease pizza pan. In a small bowl mix mayonnaise, Parmesan cheese, garlic powder, Italian seasonings. Spread on prepared pizza crust. In a large bowl toss Italian sausage, peppers and onions then add to pizza. Bake on center rack for 12-15 minutes until cheese is bubbly and the crust is golden brown.